Small towns have a way of winning us over. With charm practically oozing from cobblestone streets and character seeping from storybook buildings, small towns are often the most memorable places to visit. From Mondsee, Austria, to Hakone, Japan, and even Marfa, Texas we’ve been privileged to visited some incredible small towns around the world. But the United States has its fair share of cute, small towns, as well. Many of the most charming towns in America are already popular destinations for weekend getaways. Still others remain somewhat undiscovered. We recently visited one of these little-known US towns. It had all the makings of a tourist town… except the tourists. (You can read about our discovery at the end of this post.) Our visit to this quaint town inspired us to want to learn about other obscure, lesser-visited small towns in the USA. So, we reached out to a few well-traveled, amazingly talented bloggers from across the globe. 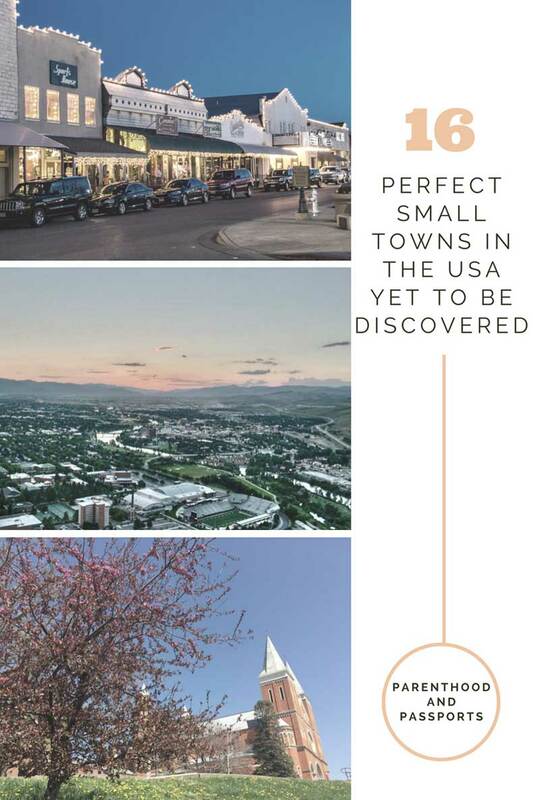 We asked them to weigh in on the top small towns in America you should visit before they become popular. Everyone has their own thoughts on what is considered ‘small’. This list of the top small towns in America was compiled by numerous bloggers and travel writers. Size is relative, and we did not put population stipulations on those who contributed to this list. For people who live in a major city like New York City or Los Angeles, anything under a population of 300,000 might be considered small to them. For others, more than 20,000 people might be considered a medium-sized town. While many of these up-and-coming towns in the US hover around 10,000 people, others are closer to 100,000. 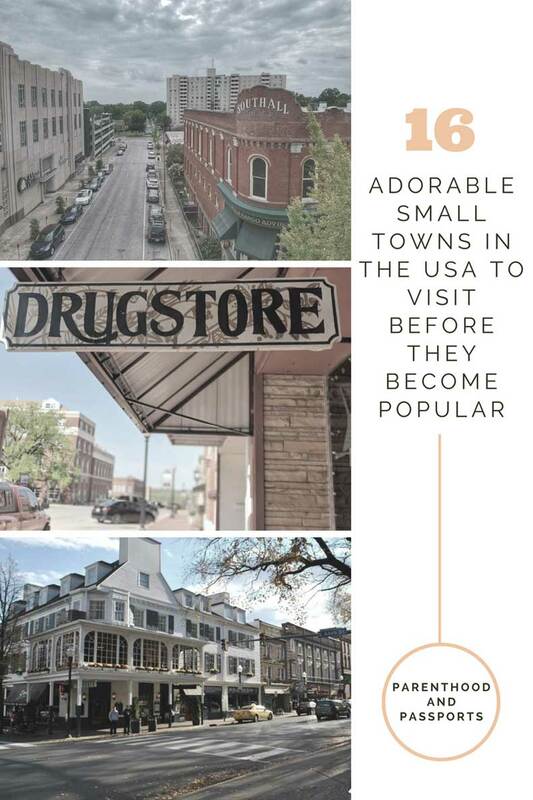 However, there were two primary qualities that each towns had to have to make our list of the top small towns in America. The towns needed to have a unique, small feel and could not already be a major tourist destinations. We asked travel bloggers from across the world to share their favorite small towns in the US that are not yet tourist destinations – but should be. Here are the top small towns in America as chosen by travel bloggers. 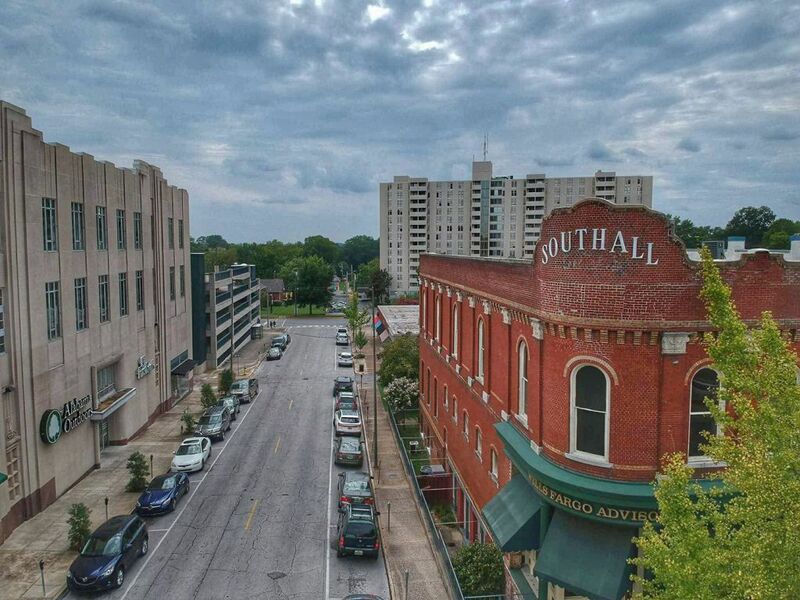 Florence, Alabama is one of the most famous little cities that no one has ever heard of. How is that possible? Music. Florence and Muscle Shoals are two little cities that have two major artist recording studios. Heard of Lynyrd Skynyrd? Cher? Rolling Stones? They all recorded some songs in Florence. What makes it special is that you’re actually able to go in and tour where those legends once walked! 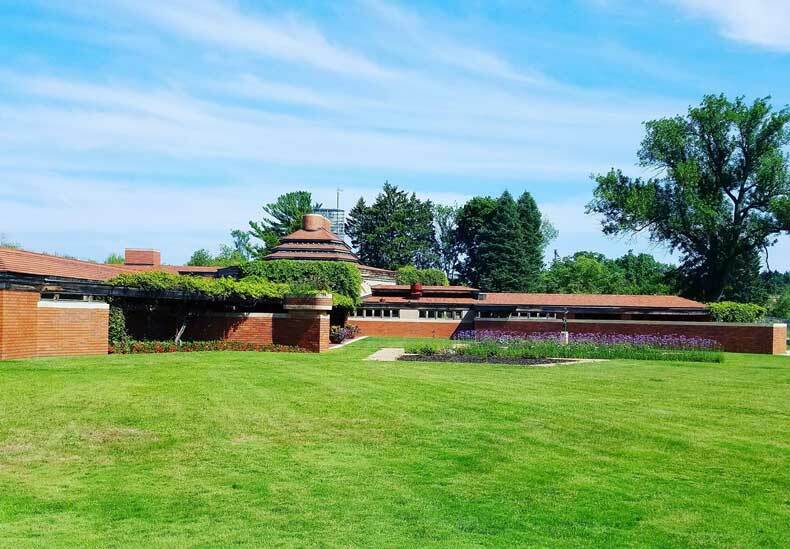 Besides famous musicians, it’s also home to the creation of another legend, this time architectural–Frank Lloyd Wright. His buildings are famous for distinctive patterns, interaction with nature, and use of natural elements. It was actually a family home, but is now tourable! If that’s not blowing you away, Florence is also a great place for families! There’s a restaurant with board games, and it’s completely decorated with hot dog art! In good weather, there’s a splash pad where kids and adults alike can splash their way through sporadic water jets! And hidden amongst the darling classic architecture of downtown are tiny fairy doors. All this within driving distance of a glowworm cave and the fun destination of Unclaimed Baggage! It’s exactly what you think it is! It’s a store filled with items from lost luggage! Located less than an hour from Pittsburgh, Latrobe is a cute town filled with history. The Neighborhood Visitor and Information Center in Latrobe has artifacts and souvenirs honoring hometown figures like golf champion Arnold Palmer and everyone’s neighbor Fred Rogers. Each summer, the Great American Banana Split Festival celebrates the invention of this delicious treat in Latrobe in 1904. If you’re looking for a drink instead, enjoy some Rolling Rock, developed by the Latrobe Brewing Company in 1939. While the brewery now produces other brands, Rolling Rock memorabilia is exhibited at the visitor’s center and microbreweries like Four Seasons carry on this Latrobe tradition of brewing beer. Once home to the first professional football team, fans can also watch the Pittsburgh Steelers practice at Saint Vincent College, the first Benedictine monastery and college in the United States. Latrobe makes traveling easy, with a local airport and multiple hotels located nearby. Come explore our hometown! Bloomington is one of those small towns you’ve probably not heard of but really need to add to your bucket list. 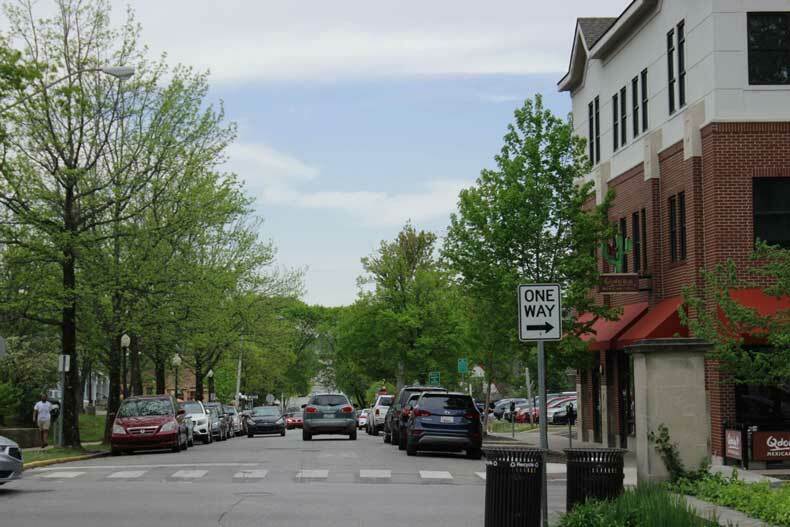 Nestled in the Midwest state of Indiana, Bloomington exists as it does today because of Indiana University and some 40,000 students (plus faculty and staff) that attend the university during the school year. Because of this, it’s a hot spot for diversity in a state, full of students around the world and international cultural experiences to boot. In the 2018 graduating class, there were students from 96 countries, every state in the US, and all but two counties in Indiana. Bloomington, affectionately known as Btown, has dozens upon dozens of incredible international restaurants both on campus and off. Indian, Thai, Vietnamese, Greek, Mexican, Korean, Japanese, Chinese, Turkish, and just about anything else is available. Plus, it hosts some of the best coffee shops and pizza parlors in the state. If you’re more excited by art, there are award-winning art galleries throughout the city, theater and festivals year-round that draw huge crowds, and some of the most artistic students in the state. I’ve attended operas, musicals, African and Indian dance shows, ballets, LGBTQ movie festivals, and countless other art shows throughout my years in the city. It has a personality of its own that all Bloomington locals adore, and it’s a gem in our lesser-known state that I can’t recommend more. Most visitors to Montana come to see Glacier National Park or ski at Big Sky Ski Resort, making the nearby towns of Whitefish and Bozeman relatively popular spots. 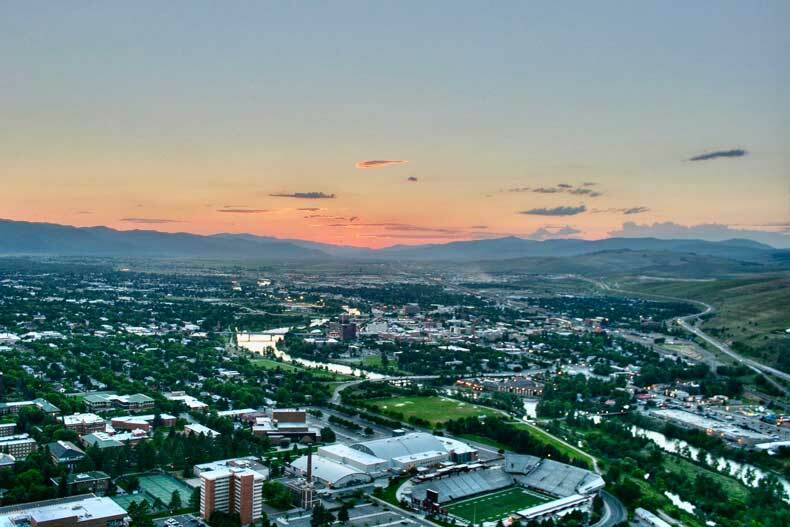 But there’s another town that deserves a visit, and it’s as progressive and it is charming: the college town of Missoula, also known as the hippie capital of Montana. Despite its relatively small size, Missoula has a thriving arts scene, with numerous galleries, great used book stores, some upcycle shops, and a thriving live music scene. In addition to many in-town venues, local and nationally-recognized acts also play at the beautiful Kettlehouse Amphitheater on the banks of the Blackfoot River, just a few miles east of town. Missoula also punches far above its weight when it comes to eating. Unlike most small towns, there’s no shortage of global flavors in Missoula, and you can sample Argentinian, Brazilian, Indian, and even Cajun cuisine. Missoula is also one of the U.S.’s top towns for craft beers, with eight breweries –that’s one for every 9,000 residents. And like many Montana towns, Missoula is a great place to get outdoors. The Bitterroot and Rattlesnake mountain ranges are a veritable playground for mountain bikers and peak baggers, while the Blackfoot and Clark Fork rivers offers Class IV and V rapids for rafters and daring kayakers. State College, Pennsylvania is the home of Penn State University and an absolutely adorable town in its own way. This university town was founded after the civil war when Pennsylvania decided to create a public university. The town itself is at the exact epicenter of Pennsylvania, making it the perfect stop-off on your East Coast road trip! If you think of an American college town from the movies, Penn State definitely encapsulates this feeling. 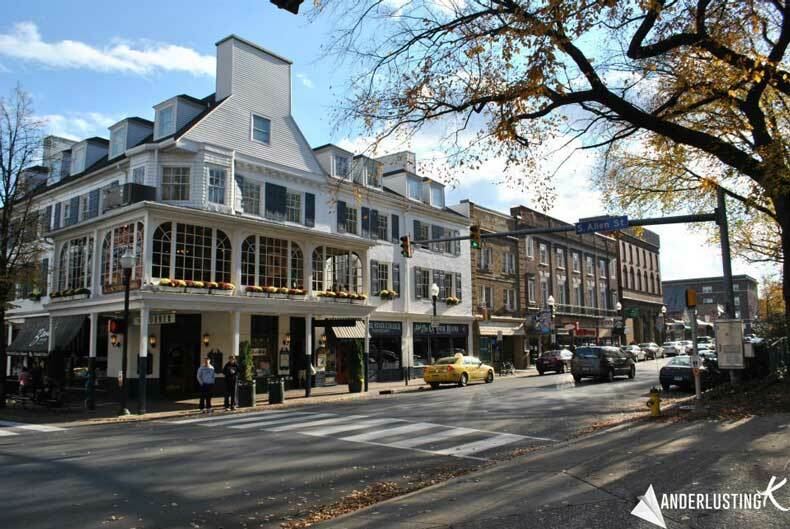 Besides having a lush campus with beautiful architecture, Penn State has a larger town around it that is full of cozy independent shops, craft breweries, great restaurants, and pedestrian friendly walking paths. 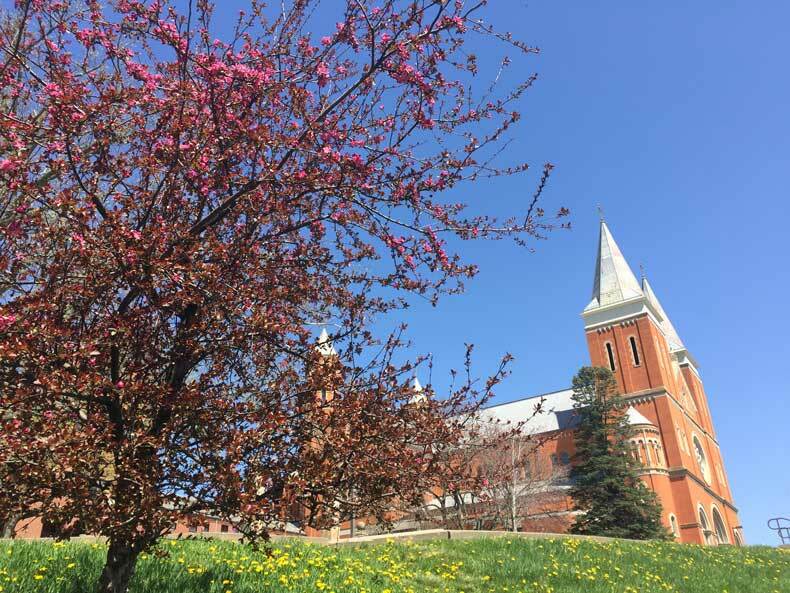 One of my favorite things to do in a nice day to get an ice cream from the famous creamery and take a walk along College Avenue… If you get bored of the campus, the town is surrounded by beautiful rolling hills, mountains, and well preserved forests. During the fall, you can enjoy the stunning fall foliage lining its adorable streets. If you’ll be driving through Pennsylvania, consider stopping off in State College, at minimum for a scoop of the ice cream from the Penn State creamery and a walk through the cute downtown area. You’ve probably never heard of the beautiful strip of beach nestled just north of the ever popular Ft. Lauderdale and Miami cities and just south of the swanky Boca Raton. This little slice of paradise is called Pompano Beach! It’s less bohemian than Deerfield Beach and less busy than Hollywood beach. But what it lacks in amenities it makes up for in quiet, clean beaches. There are plenty of beachfront resorts that offer everything you need, but it’s ideal to use the city bikes to explore a bit off the coast to find local restaurants, cafes, and shops. It’s possible to go on snorkeling excursions where you may see sea turtles, dolphins, manta rays, or even sharks! There is also an abundance of art galleries and yoga classes. In Pompano Beach there are many ways to get in touch with nature and unwind. 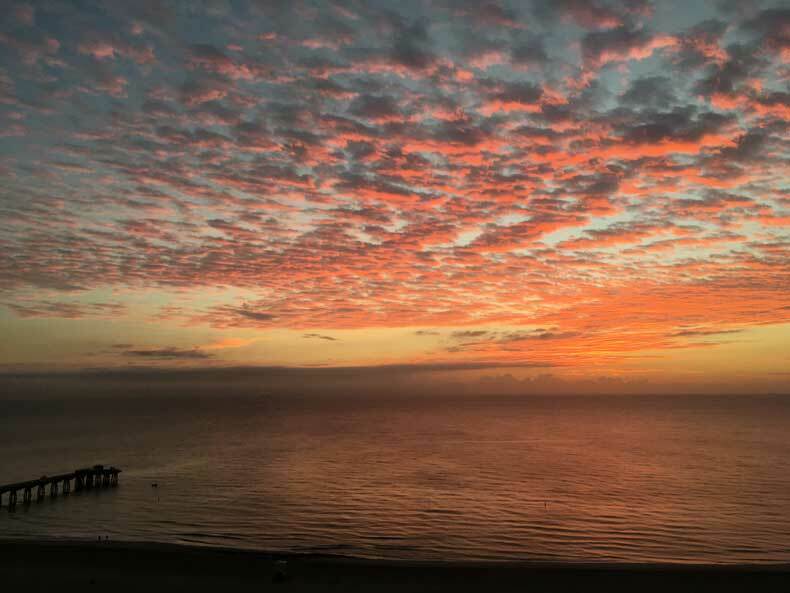 My ideal Sunday in Pompano Beach looks a bit like this: I wake up for sunrise which is never disappointing over the wooden Pompano Beach Pier. Every Sunday there is a free yoga session in Pompano Beach. After our sweat sesh, I head to my favorite cafe in the area, The Alchemist at Eucalyptus Gardens. They make a killer cup of coffee and delicious avocado toast. After breakfast, I like to head to the Fern Forest for a beautiful hike surrounded by 30+ types of ferns. For lunch, I go to the Gourmet Garden for a healthy vegan meal. Of course, there is nothing better to do in Southern Florida then head to the beach at sunset. The Bamboo Beach Club makes delicious cocktails that can be enjoyed while relaxing in the soft white sand or hanging out in their tiki huts. The first time I heard of this small town I was 19. I was meeting my boyfriend (now husband) and his dad told me he went to Brooklyn to get a car part. I looked at him with huge eyes and said “Brooklyn, New York?” I’d never heard of this small town and you probably haven’t either. I would bet money you have heard of NASCAR and maybe the Michigan International Speedway (MIS). 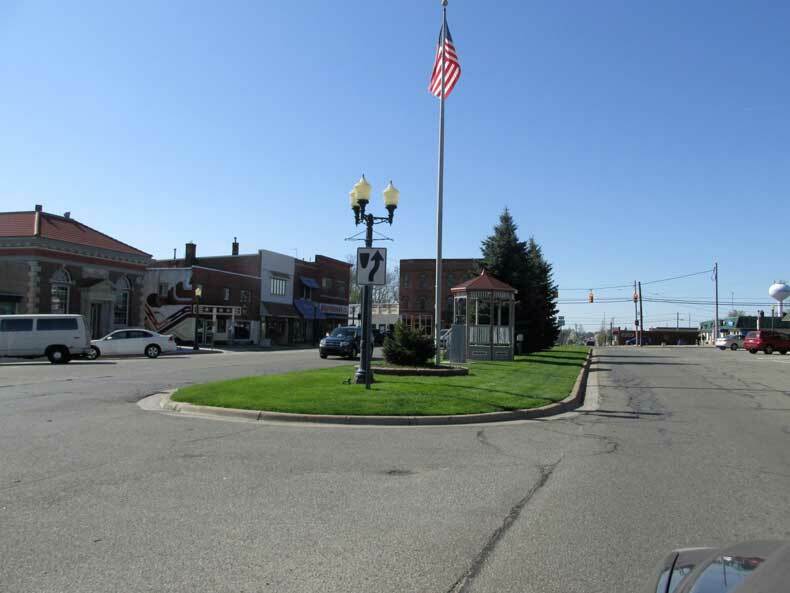 Brooklyn, Michigan is the home of the MIS NASCAR race that happens twice a year. It also hosts the Faster horses festival in July. So three times a year the little town of Brooklyn grows as big as Detroit! For the rest of the year it is a sleepy little country town that has some great local shops. I enjoy walking through the one block of downtown and visiting the unique gift shops and old-fashioned drug store. There is not a lot in Brooklyn. This area is populated by people who hunt and fish. So there is a huge sporting goods store called Kuntson’s that is a popular place year round. McDonald’s and Subway are the only fast food restaurants that you will find. For a sit-down dinner go to JR’s for a great steak or Big Boys for simpler American fare. Poppa’s Place has a wonderful breakfast, and you can sit and chit-chat with the locals. Brooklyn does have a bowling alley and I heard rumor that someone might be opening the small theater back up, which would be great. Still there are plenty of lakes around for swimming, fishing, boating and other water sports. To me Brooklyn is just a quiet country town that allows you to relax and unwind! My hometown of Racine, Wisconsin often gets overlooked as a travel destination since it’s located between Milwaukee and Chicago; and it’s such a shame! This town of 77,000+ people is located right on Lake Michigan. North Beach has been rated one of the Top 5 Best Freshwater beaches by USA Today and one of Top 10 Family Friendly beaches. For the architecture fans, we have several buildings that were designed by Frank Lloyd Wright. Wingspread was one of the largest Wright-designed homes. The SC Johnson Admin Building and Research tower was the largest commercial project designed by him. Wind Point Lighthouse is also the oldest and tallest working lighthouse on Lake Michigan. It was built in 1880, and it’s still lit every night to this day! It’s a really cool piece of Racine history, and visitors can climb to the top the first Sunday of the month during the summer. Downtown Racine is full of local gems from diverse restaurants, well-loved bars, and charming little shops! On the first Friday of the month, from April to November, you can find live music all across our downtown area, as well as great deals in restaurants and little shops. Grab a cocktail or beer to go, and enjoy the band on Monument Square with friends and family! If Taos and Santa Fe had a lovechild, it would be Ruidoso. New Mexico’s second largest ski region, Ruidoso exudes a distinct Southwest chic while staying true to its cowboy culture roots. A “cabin in the woods” type of getaway, it’s the place to fall off the grid and never want to return to reality. The river runs right through town and deer and other forested creatures can often be spotted ambling about town, ensuring the locals are extra friendly. Popular outdoor attractions include hiking, biking, horseback riding, and fishing, with lazy days at the lake and porch sitting also frequent pastimes. 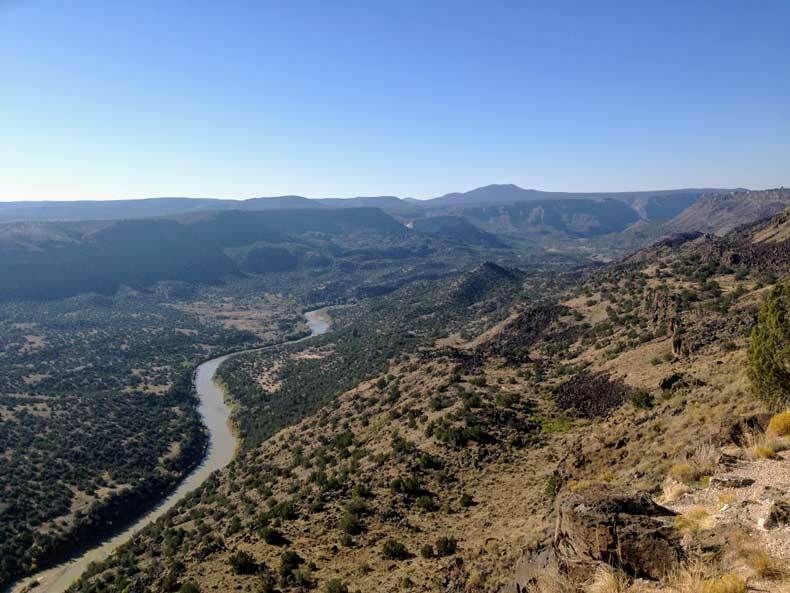 But if you do want to explore the greater area, southern New Mexico has a number of diverse landscapes in easy driving distance. From White Sands National Monument to Carlsbad Caverns, there are several places that make for unique day trips primed for photo lovers. 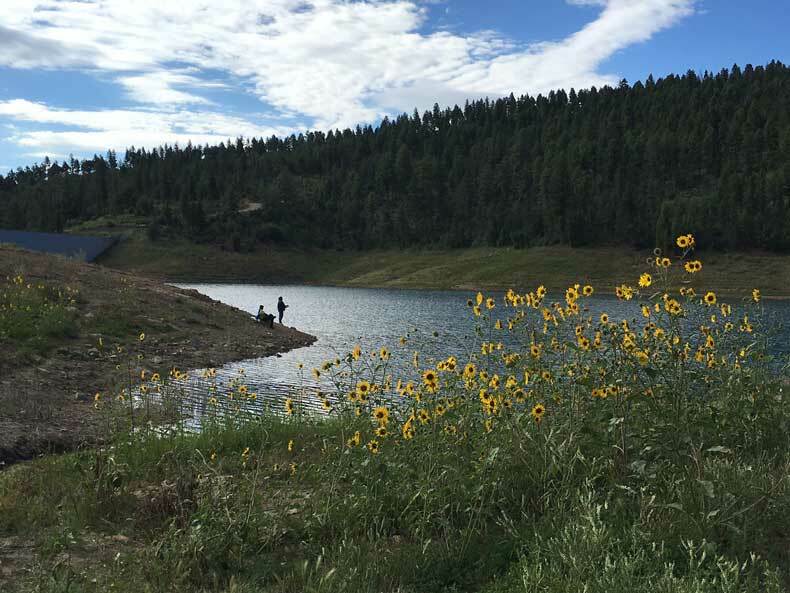 An easy jaunt from El Paso, Texas, Roswell, or Albuquerque, New Mexico, Ruidoso is one hidden gem that’s not going to stay hidden much longer. CLICK HERE FOR OTHER AWESOME PLACES TO VISIT IN NEW MEXICO. Beacon NY is a charming small town located a little more than an hour train ride away from New York City in the Hudson Valley. You can easily do a day trip to Beacon, but it could also be a relaxing weekend getaway. From the train station, you can catch the trolley that will take you to several places around town. 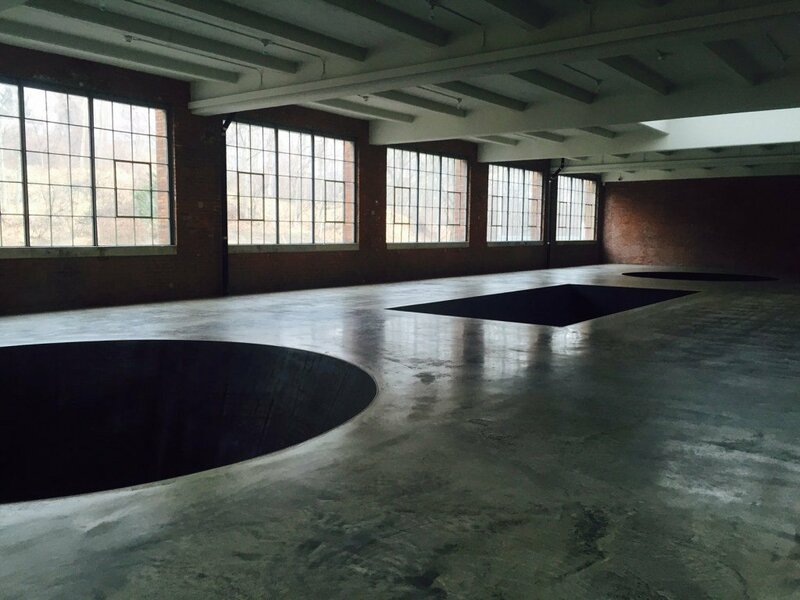 The top attraction is DIA: Beacon, which is a contemporary art museum built in what used to be a factory. You can see artwork from Dan Flavin, Richard Serra, and Michael Heizer, to name a few. I would recommend allocating 2-3 hours to see the museum. You should also visit the picturesque Main Street, which has lots of cute shops and restaurants. Hudson Beach Glass sells blown glass pieces and it’s fun to watch the artists at work. Alps Sweet Shop sells chocolate, fudge, and candy that not only tastes great but looks adorable too. Play has a great selection of games, toys, useful gadgets, and even gag gifts. If you are looking for a unique dining experience, try Pandorica Restaurant. When we walked in, we were surprised to find a Dr. Who themed restaurant! 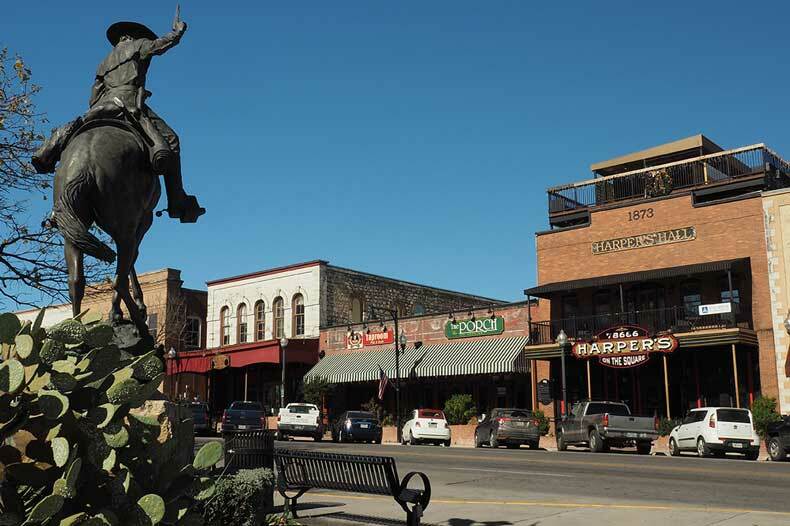 Head about 30 minutes southwest of Fort Worth, and you will run into one of the best small towns in the U.S., Granbury, Texas. 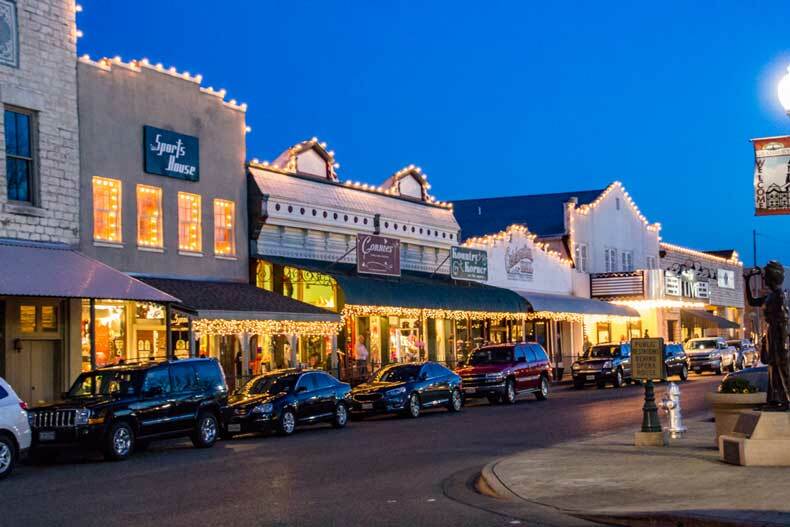 This small town located on Lake Granbury is big on charm! If you’re looking for a quiet getaway that is steeped in history, Granbury is just the place for you. Head for the historic downtown square where you can visit some of the 60 shops and restaurants. Just off of the square you will find the Hood County Jail and Historical Museum where you can tour the old cell block still intact from 1885. Take time to see a show at the Granbury Opera House where the Granbury Theatre Company has been putting on shows since 1886. Don’t leave without hitting the beach on Lake Granbury. Located about a block from the historic square you will find a great public beach and swimming area on the lake. If you’re feeling more adventurous, rent jet skis or a boat to see the town and lake from a different vantage point. After a hard day of swimming, unwind at one of Granbury’s local wineries or the micro-brewery, Revolver. Honestly, Granbury is a perfect small town in the U.S. to get away and just relax. For more great small towns in Texas, be sure and check out 15 Small Texas Towns You Must Visit. Have you heard of Lynchburg, Virginia? If so, it’s probably because you’ve been wandering up and down the East Coast. But the Hill City – as it is aptly dubbed – is worth a stop in its own right. Love history? On the outskirts of Lynchburg is Poplar Forest, the summer home of Thomas Jefferson. Point of Honor and the Lynchburg Museum are also great stops for history buffs, and Historic Sandusky housed the Union army for two days during the Civil War. Fancy the arts? With several galleries and a locally owned art store, creativity thrives in Lynchburg. Residents also enjoy live theatre and the music scene, so be sure to consider a show. Adore the great outdoors? From stunning parks to a rails-to-trails system for biking, walking, or hiking, Lynchburg offers plenty of green spaces for relaxing, exercising, or playing with the kids. Craving a bite? I don’t think I’ve ever lived in a place that has such a variety – especially downtown. Whether you want Mexican, Indian, Irish, or a genuine English tea, there is something to suit a variety of tastes. Other favorites are locally owned shops and the workmanship of the older homes. Lynchburg once had its heyday, and the historic houses are absolutely stunning! So, if you are ever passing through, feel free to look me up. I just might be in my 1922 craftsman home, walking my cat in the stroller down the avenue (he loves it! ), or shopping at one of my favorite boutiques. Let’s do lunch! New Mexico has many popular cities and towns for tourists. Artists have flocked to Santa Fe for decades and Albuquerque-related tourism is taking off, thanks to a little show called Breaking Bad. However, the New Mexican tourist boom has not yet reached Los Alamos, New Mexico. If most people have heard of Los Alamos, it’s only because it was the home of the Manhattan Project–the top secret research team that invented the atomic bomb. But for those tourists who take a chance on the Atomic City, there is a full day’s worth of wonders to explore. You can go visit the Bradbury Science Museum and learn about the history of Los Alamos and how the atomic bomb was invented there. You can follow that up with a tour by van with Atomic City Tours and explore everything from the home of Robert Oppenheimer to the present-day Los Alamos National Laboratory. (Our tour guide turned a blind eye if we tried to sneak a camera into the Laboratory grounds and take photos, which I think may be illegal.) At the end of the tour, they even gave us a complimentary lip balm with ‘Our Lips Are Sealed’ written on the side. But my lips are not sealed about Los Alamos’s charms. Be sure to check it out! When you think of California, what cities come to mind? Los Angeles, San Diego and San Francisco are obvious choices, but there are many other areas to explore! Nestled in the heart of San Mateo County is the thriving, artsy town of Redwood City. As a theatre buff myself, Redwood City boasts several playhouses with shows including theatre productions and live music. With a major street named Broadway there is no denying that the arts are alive. If locally owned restaurants are a favorite, the area offers plenty. Dine al fresco with a tapas style menu at LV Mar, eat by the water at ScrollBar Waterside Kitchen or enjoy happy hour at Angelicas. 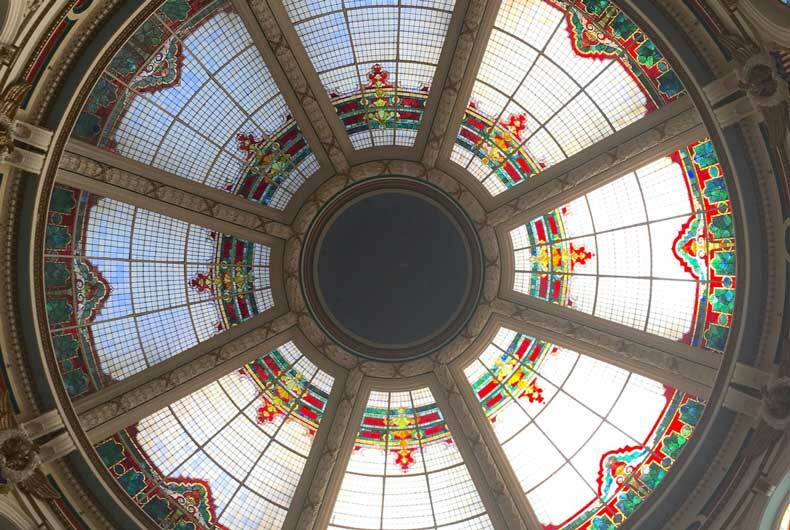 For those who like to indulge in a bit of education, the San Mateo County History Museum is both beautiful and introspective as it showcases the history of the area. Be sure to look at the architecture of the building itself while you’re there. If enjoying nature is your thing, then relaxing at the nature preserve, park, or Pulgas Water Temple are other ways to rejuvenate your senses. Saving the best for last (in my opinion! ), just a 5 mile drive outside of Redwood City is Filoli, a historic estate built in 1915. With thriving gardens, a gorgeous Georgian style home, and a café, this just might be the place that will steal your heart. No matter whether you are passing through or setting it as your final destination, Redwood City has a lot to offer for a variety of tastes. From beautiful heritage houses to the year-round 72 °F warm river, San Marcos in Texas is one of my favorite small towns in the US. When I first came to this little gem between San Antonio and Austin, I instantly fell in love. It’s like a hidden treasure and totally worth a visit. Driving down the roads in the heritage district of the city is one of my favorite things to do, even if I already know every single building. In summer, you can float down the river, go kayaking, or paddling on a SUP. The river float is the main attraction in this area. People of all ages spend their weekends at the river. Besides this, San Marcos is also home to some endangered species like the blind salamander, who only lives in this area. You can take a glass bottom tour in the nature preserve to learn more about the unique flora and fauna. The most important part of San Marcos, however, is getting in touch with people. It doesn’t matter where you go, you will always meet super friendly and welcoming people. So if San Marcos hasn’t been on your US bucket list, you should add it now, and visit it as soon as possible! Finally, the small US town that inspired this post. Guthrie, Oklahoma is everything you hope a small town would be. It is quaint, historical, picturesque, and yet full of fun things to do. Beautifully preserved, old red brick buildings line the downtown streets of Guthrie. The scenic downtown area is a National Historic Landmark and a popular destination for photographers looking for an old-fashioned setting. While the town is small, it is anything but sleepy. The century-old buildings are now filled with museums, coffee houses, and antique stores. 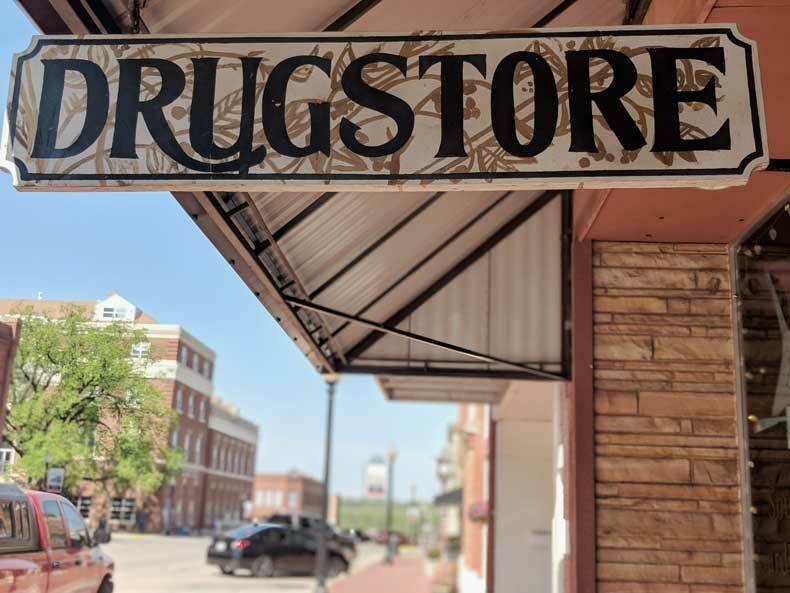 Located just north of Oklahoma City, and a few miles off the historic Route 66, Guthrie, Oklahoma is a great place to spend a morning exploring when passing through Oklahoma. To prolong your stay, spend a night in quaint bed and breakfast and enjoy an authentic experience in quiet rural Oklahoma. This laid back, friendly small town is truly underrated, making it somewhat of a gem untainted by mass tourism. What would you say are the top small towns in America? Leave your suggestions in the comments below. I love this idea! I’m ebarrassed to admit that I’ve only heard of three and visited none of these towns. When I’m back in the States, Lynchburg is now on my list– I live much too close to NOT give it a visit. I’ve been to 7 of them, but I lived less than an hour away from one of these towns for 5 years and never visited. Ohhh! I’ll have to check out Washington’s cute towns now! Great collaboration! Loved the post, most of these towns I would never have heard of! Added some to my bucket list, thanks! Native Virginia here, totally agree with Lynchburg! It’s also the home of Liberty University, so I’m impressed it still has such a small town feel despite having such a large school around. I’ll need to visit some of the other towns on this list! Love this list! So proud seeing Racine in there, as I am from Wisconsin! Most people definitely overlooking visiting Wisconsin and I think it should be on everyones list! I love Bloomington IN – great choice for your list! I think I’d like to check out Missoula Montana in the future as well. Thanks for sharing. Pinning for later. I so love visiting small towns, so fun! I knew of some of these but not all, wish I had scene this collab on FTB, there are tons of them here in WA state I love to highlight! Oh my gosh! I love small undiscovered towns! And Granbury, Texas looks right up my alley. Perhaps for a weekend trip one day? These are such great ideas! I’ve actually only been to a couple so it’s nice to find some new options. We absolutely loved Missoula when we visited the town during our road trip last year. Such a cool town and lots to do with kids there too. I’ve been to both, and you won’t regret either! Los Alamos is close to Santa Fe, so easy to visit. Make sure you visit Bandelier National Monument when you are in the area. It is really cool.